Advance your understanding of the economic potential of the under-explored Mid North Sea High region, and discover significant new insights about the UKCS. The multi-client Mid North Sea High SEEBASE® Study and GIS is an integrated geological and geophysical study of basement and basin evolution of the Mid North Sea High region on the United Kingdom Continental Shelf (UKCS). The Study provides improvements in regional understanding of this area and supports exploration, development and investment on the UKCS. The Mid North Sea High SEEBASE® Study and GIS includes integrated interpretation of public domain and UK OGA-supplied potential field datasets, geological maps, plate reconstructions, literature, published cross-sections and seismic sections, and UK OGA-supplied 2D seismic and well data. 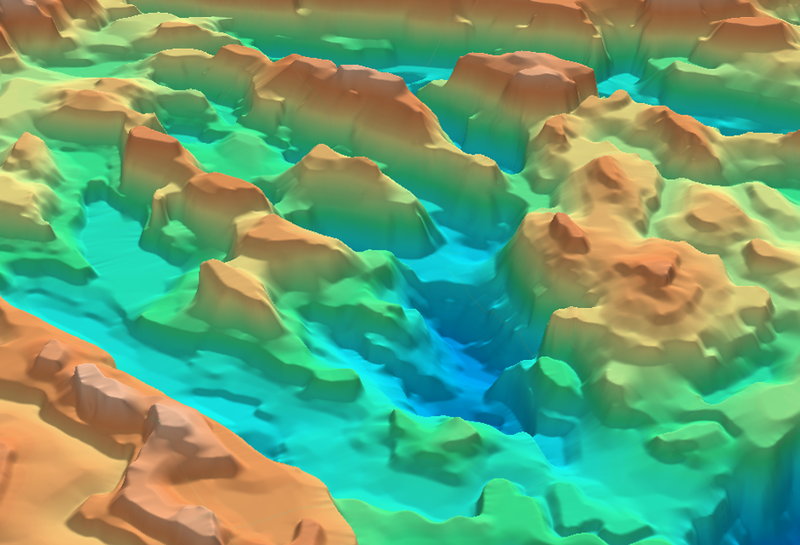 Oblique 3D image of part of the Mid North Sea High SEEBASE®. Mid North Sea High Study colour shaded relief image of Free-Air Gravity data - Area of Interest (black polygon) showing coverage. The Mid North Sea High SEEBASE Study and GIS provides a new interpretation of geological basement for the Mid North Sea High and surrounds and will advance your understanding of the economic potential of the under-explored Mid North Sea High region. Basement has proven difficult to image on available seismic data in the Mid North Sea High region due to widespread Permian Zechstein salt. The new regional depth-to-basement grid (SEEBASE) represents a significant step forward in understanding the geometry of pre-Permian Paleozoic basins. Basin locations and geometry are largely controlled by basement terrane boundaries. Revised and newly-interpreted basement terranes provide an explanation of this tectonically complex area at the collisional triple junction of the Baltica, Avalonia and Laurentia megaterranes. Persistent structural highs such as the Mid North Sea High Platform and Devil's Hole Terrane are influenced by large sub-basement intrusive complexes that mark the abovementioned collisional junctions. within deep half-graben interpreted in the Mid North Sea High area. Gravity models support the interpretation of locally deep basement with fault block and graben geometry in the Mid North Sea High area, conventionally considered as a peneplained structural high. Above: Oblique view of Mid North Sea High SEEBASE with coastline in white. Plate reconstruction models using the newly revised Mid North Sea High basement terranes show the relative position of these terranes and megaterranes during key tectonic intervals. An overview of basin development including both a stratigraphic chart and a tectonic event chart shows key events and drivers. A geologically-controlled regional model for basement-derived heat flow provides necessary input for basin maturity models. The SEEBASE and Moho provide required inputs to produce crustal thickness, basement thickness, and total sediment thickness maps/grids. Join our mailing list if you would like to receive future product and service updates from Frogtech.